Colonial Villa was really nice. My mother-in-law is in her own apartment. It doesn't feel like an assisted living place or a hospital. The staff is wonderful. The dining room is really nice. She sometimes likes the food, and sometimes she doesn't. They have all kinds of activities there. They do aerobics, they go out to the movies, and they have a travel day once a month where they do activities that surround that region. They might make pottery and they'll have a dinner that's prepared for them by a chef of that particular region. Colonial Villa was very nice. I like it. It was nice and clean. I like the rooms and the layout. It appealed to me, and the price was good. They have big rooms. Food was good too. Hi Shirley, Thanks for your positive response! I enjoyed meeting with you and your daughter a couple of months ago! If there is anything I can do for you, please don't hesitate to ask. I hope you are doing well! Colonial Villa was my least favorite out of all the places I visited that day because there was an odor. The rooms were big and the whole place was big and less home-like. The people weren't friendly. The lady who showed me around was kind of in a hurry. As she was talking to me after the tour, she was packing her bag. Overall, I did not like it, and it seemed impersonal. Colonial Villa has support care, but they don't do memory care all the way. If you act out sexually or are combative or a wanderer, they don't keep you. The studios are beautiful. They have nice views, big windows that look out over the trees. I had the food there. It was pretty good. They have a chef. It wasn't gourmet or anything, but my dad would probably be happy with it. I liked it, but I realized my dad needs memory care, and so I'm no longer considering it. I love the studio de luxe that I looked at. It's very large. It has a bar with a sink and a refrigerator. 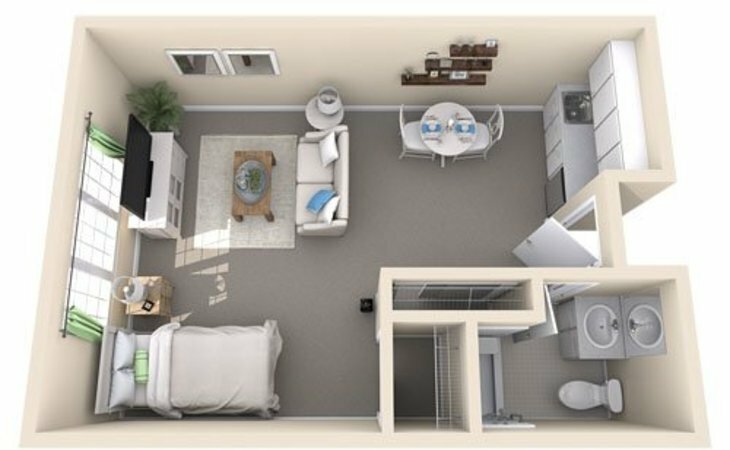 You could probably have a microwave so you could cook in your room a little bit, and they have a refrigerator and their own bathroom. It was a lovely room compared to some places I've looked. The staff seemed very nice. It's really more of an assisted living setting. We took a tour at Colonial Villa and it was a very nice place. They had a wide variety of apartments. The staff and their dining room were nice. I liked it. However, I thought I liked it more than my mom did and I wanted to keep her happy too. It would have been closed to her friends and close to home for her. My husband stayed in Colonial Villa of Midland for a respite care. I thought they were good. I knew quite a lot of people who were out there. The facility was very nice and clean. People working there were also nice. Their rooms were equally nice too. I had no complaints about them. I was just sorry it didn't work out with my husband. He demanded a whole bunch of care than what they could offer at that time. Three years ago, when our mom was 94, she decided to move from Chicago to an assisted living arrangement in Midland. Our family thought Colonial Villa was the best fit for mom, and we were delighted when an opening became available. Now, after three years, we could not be more pleased with how well everything has worked out for mom and our family. From the beginning, mom has appreciated not only the atmosphere and physical amenities of Colonial Villa, but more importantly, the competent and caring staff. The staff is a supportive family and always treats mom with kindness and respect. In a gentle, courteous way, they help mom participate in the wide variety of activities at Colonial Villa under highly skilled leadership. We appreciate the staff's sensitivity in their interactions with residents. The staff provides compatible, supportive and enjoyable meal times and a safe and healthy daily life for all residents at Colonial Villa. What should caregivers and potential residents know about Colonial Villa?